Western blot analysis of extracts from NCI-H2228 cells using ALK (D5F3®) XP® Rabbit mAb (Biotinylated). Streptavidin-HRP #3999 was used for detection. 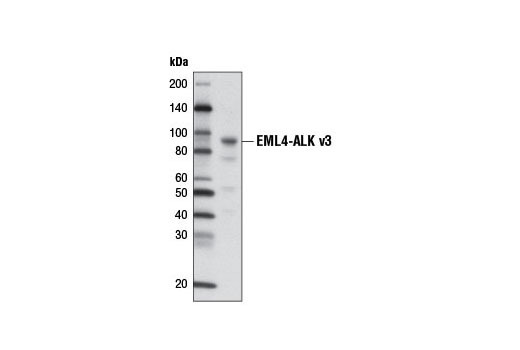 ALK (D5F3®) XP® Rabbit mAb (Biotinylated) detects endogenous levels of total ALK protein as well as ALK fusion proteins, such as EML4-ALK variants and NPM-ALK, even at low levels. This antibody does not cross-react with other family members. Monoclonal antibody is produced by immunizing animals with recombinant protein corresponding to residues in the carboxy terminus of human ALK protein. This Cell Signaling Technology antibody is conjugated to biotin under optimal conditions. The biotinylated antibody is expected to exhibit the same species cross-reactivity as the unconjugated ALK (D5F3®) XP® Rabbit mAb #3633.